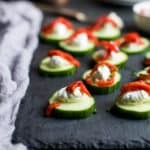 Fresh Simple Cucumber Bites topped with a zesty Herb Cream Cheese and sweet Piquillo Peppers. The perfect refreshing appetizer recipe for your next party! To a small bowl, add cream cheese, chives, garlic powder, red pepper flakes, and dry basil. Using a hand mixer, blend until all the spices are combined together and cream cheese is smooth and spreadable. Put cream cheese mixture in a small ziplock bag. Closer the bag. Cut off one of the bottom tips. Top each cucumber slice with a 1-2 teaspoons of the cream cheese mixture. Garnish with 1-2 slices of the piquillo peppers. Note: if not serving right away, keep refrigerated.